According to a Harris Interactive poll conducted by the French newspaper “Le Parisien”, the French population is extremely concerned by the current Debt Crisis. In fact a whopping 79% of those surveyed in the poll said they feared the consequences of the global economic crisis on France. Yet much more astonishing than the obvious concern over a global economic meltdown, is who the French said they trust most to lead them out of the current crisis. 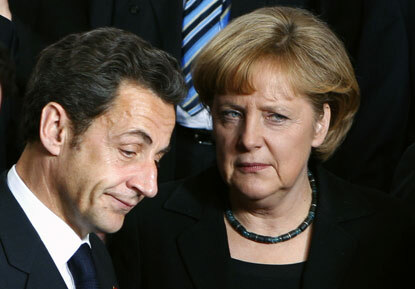 Forty-eight percent of the French population said they trust Angela Merkel and the German government more than they trust both Barack Obama’s administration and their own government, led by Nicolas Sarkozy, to lead them out of the current Debt Crisis. Despite the recent US Downgrade, thirty-seven percent of the respondents said they trusted the Americans most, while only thirty-three percent said that the French government was the country’s best hope of finding a solution to the crisis. The French also share an understandable mistrust of the Rating Agencies, Banks and Traders to lead them on the road to recovery. So it seems that German Chancellor Angela Merkel is now being viewed as not only the savior of the euro zone but also perhaps the best chance the Western world has for a strong economic recovery in the near future. Despite its high hope that Germany can step in to save the French economy, the French population is also well aware that the country will have to do its own part to stymie the economic troubles. A large margin of 85% of the French population are in favor of cutting the State expenses in order to reduce France’s spending deficit, 85% of them, while only 12% support a tax raise.